My question is, Does anyone know the Official MTO regulations for securing down a snowmobile to a truck or trailer? I have read on other forums that there must be 4 points and each point must be rated for total weight of snowmobile. I am going to be using a open 4 place snowmobile trailer, (deck over not enclosed) so i'm open for the world to see and one snowmobile in box of truck. Last year I was like a magnet for MTO/Police. Mostly over lights and weight class of my 1 ton truck, do I need a CVOR, is the trailer safe etc. No issues their, all was cleared up but then they never looked at the tie downs so it got me to thinking about the tie downs. I used 3 ratchet straps per sled which was a real PITA!! and if there saying I should of had 4! OMG! remember here I'm hauling five sleds so everything is x5. Thanks so much for your reply. I'm just trying to do my homework now before I do get pulled over, because I will. Until I can save the $$ for an enclosed, this is just reality now for me. i have never been bothered with only 2 straps per sled. might have to look at the difference between commercial and recreational as there are differences. if you are pulling with a company vehice, they will make you use the commercial rules. Last edited by Maim; 12-28-2018 at 08:39 AM. 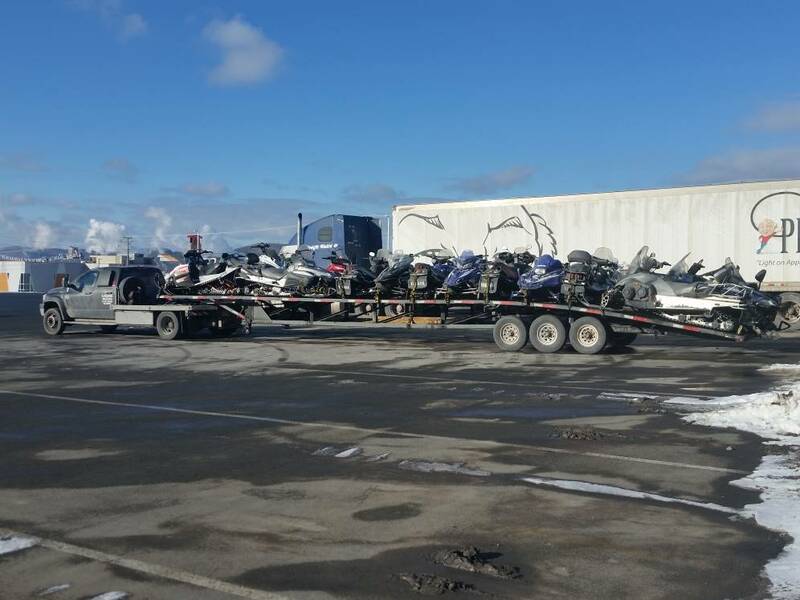 Been through many dot inspections across canada and USA hauling up to 15 sleds per load. Never more than 2 straps per unit. Never an issue. Some jurisdictions do require 1 strap per wheel on wheeled units though.